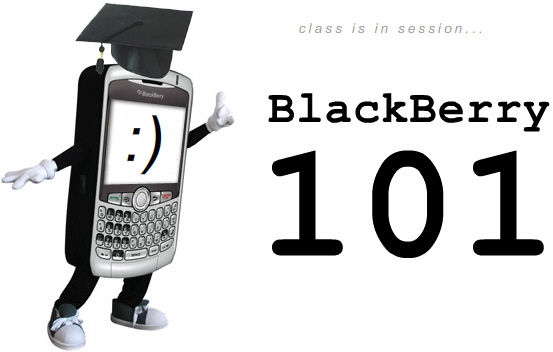 Back to School with CrackBerry.com... BlackBerry 101! Enjoy your last week of holidays... come Monday, September 10th, class will officially be in session! For the next eight months, each week CrackBerry.com will publish a new informative, educational and (hopefully) entertaining BlackBerry 101 article that by the end will make you an official graduate of the BlackBerry School of Higher Learning (you may or may not want to add it to your resume!). I'll be leading the course, but since I've always considered myself to be more of a BlackBerry Addict than Expert, we'll also be featuring a number of guest lecturers over the weeks ahead to help round out the curriculum (think you have what it takes to teach a class or two?! email kevin at crackberry.com). By the time we break for summer, all of us will be Blackberry Smartphone Experts! All BlackBerry Users and Abusers are welcome to attend (heck, you can come along for the ride even if you don't own a BlackBerry yet...by the end you will!). We will be starting with the basics (Which BlackBerry to Buy, Device Functions, etc.) and will increase the difficulty as we go... by the end you'll be building your own BlackBerry Themes! From Newbie to Expert in eight months flat, and the Price is Right! There WILL be a test at the end (100% final), but don't worry, you have plenty of time to study (tell a friend about BlackBerry 101 and you'll have someone to study with! ), and if for some reason you don't manage to score a great mark we won't put it on your permanent record. And if you join the CrackBerry.com Fraternity (also free), you'll receive a ton of valuable benefits - free wallpaper and ringtone downloads, unlimited help in the blackberry forums, your very own @CrackBerry.com email address, and more!) Learn More or Sign-Up Now!